Fantastic, Shanna was great, knowledgeable & quick replies. 200 feet from the water, two doors down from the Clearwater Dive Shop and halfway between West Bay and West End. 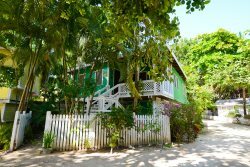 This little gem is where you want to be for a quiet getaway, good diving and easy access to the nightlife and restaurants in both nearby communities!! We rented a little motorcycle to get around but also walked both ways up and down the beach to both communities. It was less than a 15 minute walk to West Bay and about 20 minutes to West End and there lots of stopping points along the way. We plan on staying here again!! REPLY: We're happy you enjoyed your stay and look forward to having you back. Thank you! The staff was very friendly and accommodating. Casa Martin is my favorite place on the island, the best view, the best location for snorkeling, very short walk along the beach to a variety of restaurants. I highly recommend it! My wife and I thoroughly enjoyed our stay at the Tortuga House! Everyone we spoke/emailed with was vey helpful and very friendly from booking, to arranging transportation from the airport, check in to check out! Shanna was extremely helpful with local information and Fernando was very friendly and our local connection for activities/suggestions in lining up paddle boarding. The security guys were also super friendly and reassuring that we had a safe and relaxing stay! We will definitely be back to stay with Island House because of the location in West Bay, close to the beach, and how incredibly helpful the entire staff was. We look forward to our next trip and thank you again for making it a very special vacation!! Fernando, Julio and his maintenance staff, Rene and his staff, Sonia and her staff, Francisco, Myron, Lincoln, Carlos, Kerley and all the security staff, are friendly, efficient and knowledgeable. We really appreciate them all. Casa Martin is THE place to stay on West Bay! The house is literally only a few feet from the water. So we could hang out in the hammocks on the deck and still feel like we were on the beach. Right off the deck was a private area with chairs on the sand as well. True laid back Caribbean luxury. The house itself is high quality, comfortable & spacious with 3 BR/3 ba. Beds are comfy & the AC kept us cool even in the June heat. Be aware there is no dishwasher or washer/dryer. This wasnt a problem for us & they would do a load of laundry for $5 if needed. The area of West Bay makes for a wonderful vacation. Clear calm water with an incredible snorkeling reef essentially right out front of the house. The water taxis are right out front as well but a roped off area provides a large swimming/playing area so the boats were not an issue. Many good restaurants line West Bay beach so leave your shoes behind and walk a couple of minutes for any meal. West Bay Village is a great setting, had great management, and maintained in every detail. The onsite security was always present & friendly. We felt very safe there. If our family is able to return to Roatan, there is no other place we would stay! Everyone at Island Vacation Rentals was a dream to work with. They answered all of our questions, provided information about the island, and even set us up with a private chef which was a highlight of the vacation! Can't wait to to go back and will dream about Casa Martin for months to come! The Island House Vacation Rentals team was great to work with! Everyone was extremely nice and super helpful. I really appreciated their quick responses. We absolutely loved our stay in the Tortuga House! Everything about our stay was wonderful - the rental team, the house, the location, etc. This was our first trip to Roatan and we will be back! Everything from the moment we booked our trip online to when we got back on the plane to go home was excellent. This vacation exceeded all my expectations- The house was nicer than I expected (even though the pictures looked great), the beach was more beautiful than I expected, and the service that Island House provided was really phenomenal. Fernando took a lot of time to help us plan our trips, find restaurants and decide how to spend our time in Roatan. I really can't say enough how amazing he is, and how much he added to our trip being as wonderful as it was. I felt like his help allowed us to still go on adventures without the normal stress of planning in a place that you don't know. We already knew a day into our trip that we would be returning the following year and that we want to continue to rent from Island House, and especially Fernando. Lordes did an amazing job keeping the house clean and tidy as well. We LOVED everything about our trip and Island House was a big part of making it such a success. The whole team of Island House are fantastic, from management, housekeepers, gardener's and security personnel. They truly make your vacation relaxing and enjoyable. Always there if you have any questions or need anything. We wouldn't stay anywhere else on the Island, love West Bay Village. We have been coming back every year for the past 7 years. Truly an enjoyable experience. Love you guys!!! Everyone was helpful and friendly. Satori's was great, great location. REPLY: We're glad you enjoyed yourselves, it is always a pleasure having you back! Fernando is the best. All staff was knowledgeable, professional and friendly. Beautiful, clean, full gourmet kitchen, maintenance people friendly and respectful, professional, relaxing. I cannot say enough good things about Island House or Shalyamar! REPLY: Thank you very much for your great review, please come back and see us again! We had an amazing time. This was my second trip to Roatan. But the first for my mom and best friends. We all had a relaxing time and enjoyed every day to the fullest. The property was clean, well equipped with everything we needed. The only suggestion we had was maybe updating the shower fixtures and put a plug in the bathroom sink. Other than that - it was perfect! Thank you for such a wonderful experience. REPLY: Thank you, we are happy you all enjoyed yourselves. We also appreciate your suggestions and have passed them along to the owners. We loved to stay at Casa Martin. The only claim is, that the beach sunbeds do not have mattress, they are very hard to lie on. REPLY: Thank you, we are happy you enjoyed yourselves. We've also passed along your suggestion to the owner and hope to have some chair cushions made soon. Very friendly and eficiente people. A very confortable and well equipped house. Very crean. REPLY: Thank you very much! We truly feel in love with all the people that make West bay Village so very special! Shanna was helpful and was always there to answer all our questions, making us feel welcome, and made sure we got to the airport on time. Milo was our security guard and he is truly a special person. He watched over us and especially my dad who can be a little clumsy at times and made sure we always had fresh water, a truly wonderful person. Our housekeeper did a few loads of laundry and the detergent was delightful smelling and the clothes came out beautifully. Everyone we encountered were a true gift! REPLY: Thank you so much for your kind words, we do feel blessed to have such a great staff! West Bay Village is a true slice of heaven. The property was impeccably clean, beautifully decorated with stellar amenities. The bed sheets were so soft and the whole place was well thought out, leaving you wanting for nothing. From our porch we could see the gorgeous turquoise water and white sandy beach. The beach was kept spotless and raked daily. The property is located centrally to everything in West Bay so you can walk to everything and don't need a car. The snorkeling right off the beach is some of the best we have ever encountered. We had the best two week vacation of our lives and highly recommend it! We will be back for sure! REPLY: Thank you very much, we look forward to having you back! Super-friendly and efficient team. Appreciated the communications before the trip, which helped us prepare and even arrange for some activities (snorkeling trip). Check-in and check-out was a breeze, and Fernando was always happy to make arrangements for us. On our last day we had some rain water come in through the wall during a storm with hellish rain, and in no time a whole army of people showed up to help and fix the issue. The property was super! Rooms were great and tastefully furbished. Extraordinarily well equipped kitchen! Super-nice touch was to find the fridge stocked with roasted coffee, beer, milk, banana bread when we arrived. We loved the sandy patio area. The beach had a lot more hustle and bustle than what we expected but somehow the patio provided an oasis of calm and quiet. And the security guards made us always feel safe -- and were very friendly. Only two negatives: the wifi was very spotty and unpredictable. And we had quite a few power outages. All in all, we truly enjoyed our stay at this property and were impressed with staff. REPLY: Thank you, we are happy you enjoyed your stay. We have since upgraded the wifi and the coverage is much more complete throughout the house. Fantastic place to relax and enjoy the beach. REPLY: Thank you, it's always a pleasure to have you back! Beautiful location, there is no need for a car, the rental house makes you feel like home. I love the fact that the children room had toys included. Staff is super friendly and genuinely care about your stay being a relaxing experience. I think "we will definitely return" says it all. Villa exceeded our expectations! REPLY: Thank you so much, we look forward to having you back! West Bay, Roatan, Bay Islands, Honduras C.A.